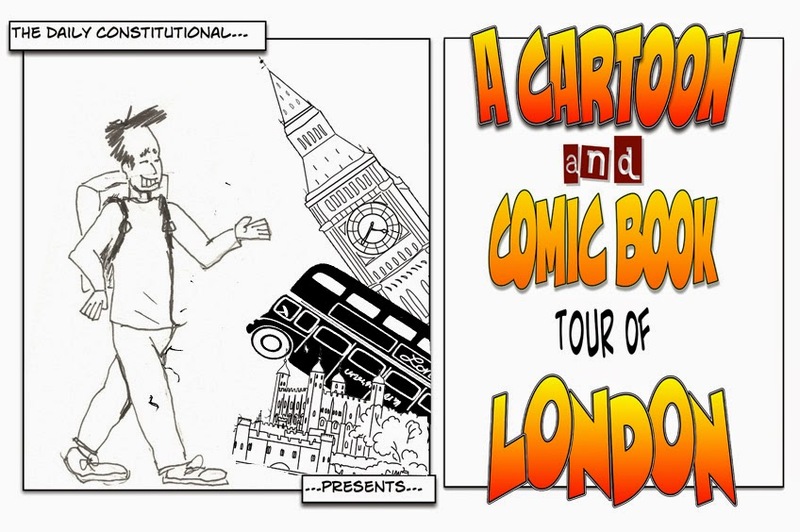 Earlier this year Daily Constitutional editor Adam took us on a Cartoon & Comic Book Tour of London – 20 stops on a metropolis-wide search for all things illustrated. I've crossed a lot of bridges in this series so far. Tower Bridge in particular is much-loved by cartoon and comic book artists. 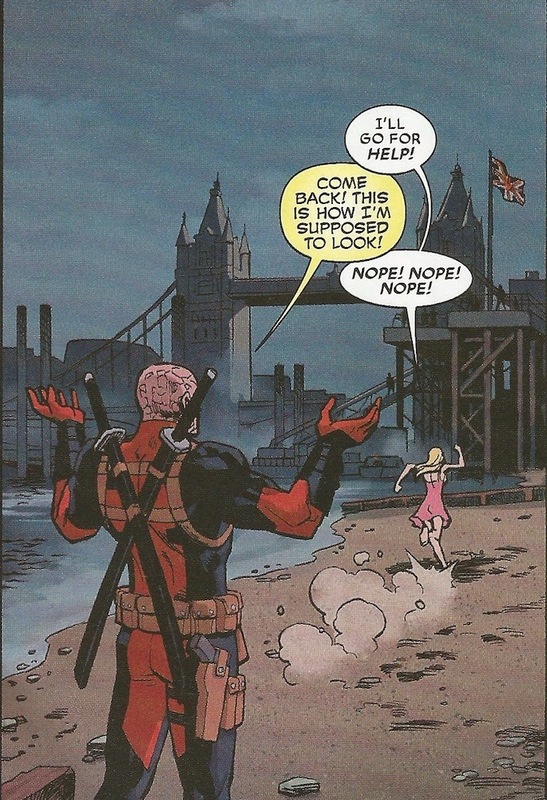 It featured in my earlier posts on Spiderman and Deadpool from Marvel comics. That grand old structure is part of the instant visual grammar of London, as discussed in those earlier posts. 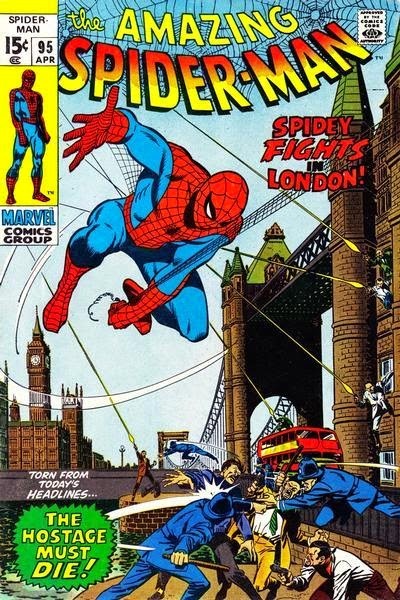 But aside from location, what is it about comic book artists and the bridges of London? First and foremost, the dramatic potential of a bridge is undeniable: it can be the beginning of a quest or a homecoming. Then there's bridge as metaphor, a monument to mankind's flimsy conceit that water has been conquered. Which brings us back to drama once more with the ever-present prospect of being driven from the bridge by forces beyond your control. Did he fall… or was he pushed? In the context at hand, it's important not to forget perspective. Those talented individuals who draw our comic books just love to rub our merely mortal noses in the vanishing point! The choice of bridge is also revealing. Like a great London Walks guide, the cartoon artist who wants to root her/his story in true London won't just scrawl Tower Bridge shaped like some Gothic hashtag and add the caption "Tower Bridge". The best ones go off the beaten track. In our series so far I've also crossed the Archway Bridge known to locals as "suicide bridge", a perfect location for the supernatural hipsters of London in The Vinyl Underground. Workaday London Bridge is used vividly to illustrate alternative lifestyles in the glorious Metroland. And Battersea Bridge adds a subtle, dowdy, Len Deighton-style flourish to the otherwise Ian Fleming-ish world of spy thriller Velvet. As a story it's been around for a while now – Ben Aaranovich's original novel was published back in 2011 and met with great critical praise. In its pages we join the adventures of Peter Grant, a young police officer who works in the small division of the Metropolitan Police that deals with magic and the supernatural. 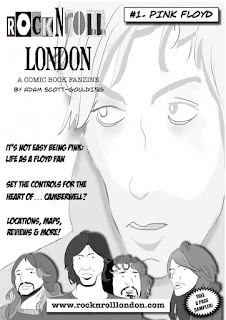 The book is woven with London myth and lore and is perfect for comic book adaptation. Mr Aaronovitch shares the writing credit on this version of his tale with Andrew Cartmel (a prolific writer who once worked as a Doctor Who script editor), with art by Lee Sullivan (Doctor Who magazine). 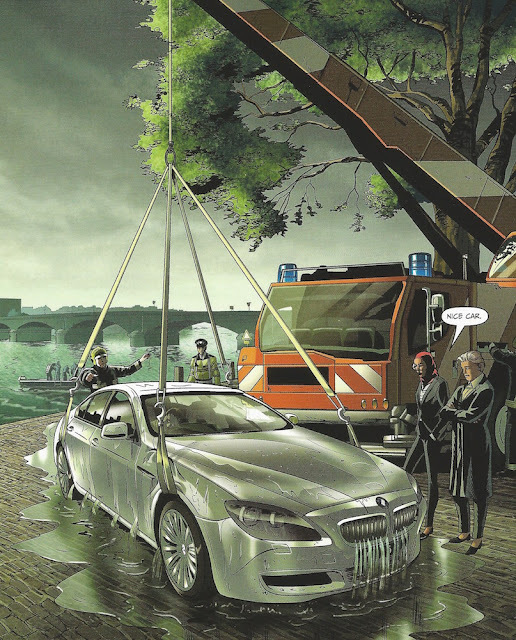 The comic book also features a wonderful appendix addressing the history of Putney, opening with the memorable line about this riverside neighbourhood being "deeply confused about whether it's cutting-edge trendy or just ridiculously suburban". Nicely done. 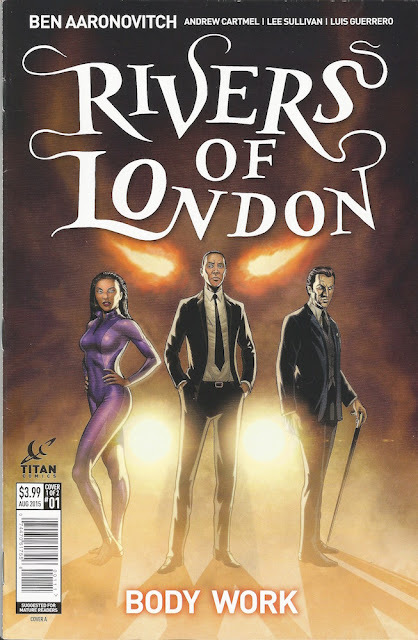 With the tale so deeply embedded in the legend of London, I'll probably return to this comic book later in our series (at the moment I'm updating this little "blog walking tour" about once-a-month) but in the meantime I'm anticipating that Rivers of London could well take the place of Über (which is going on sabbatical) as my new fave non-superhero comic book. Issue 2 of Rivers of London, published by Titan Comics is out in August. Visit Titan Comics website here: www.titan-comics.com, follow them on Twitter @ComicsTitan and become a fan on Facebook facebook.com/comicstitan. Coming up later this year on The Cartoon & Comic Book Tour of London… We'll be dallying with Cruickshank in the 18th Century, chasing the Rolling Stones in a tie-in with the Rock'n'Roll London Walk, and looking at another Titan Comics title Death Sentence London. 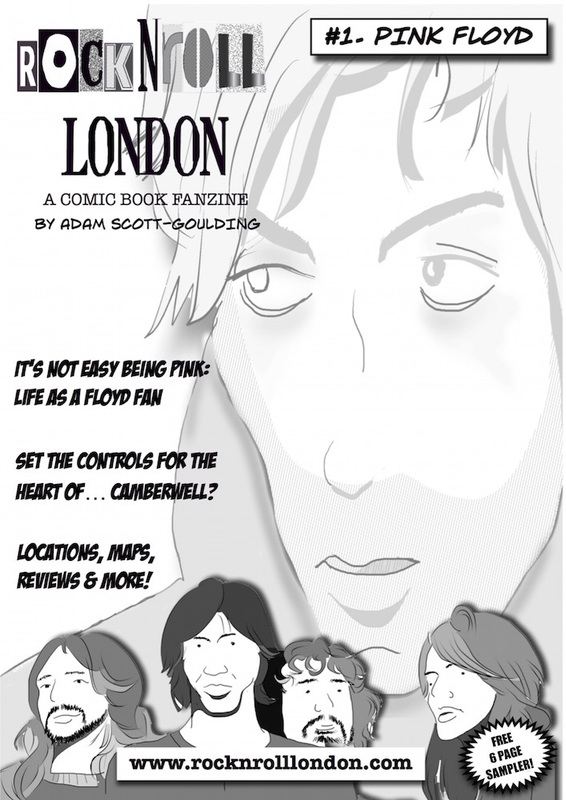 Adam's Rock'n'Roll London Comic Book Fanzine Issue No.1 is available now!